When in Connecticut you'll never run out of fun things to do. There's something for everyone. From non-stop entertainment at the state's two immense casinos to museums and historic houses to quirky attractions to memorable food and wine experiences, Connecticut offers more than many travelers expect. Connecticut has bustling coastal cities and charming rural areas dotted with small towns. Most know about Mystic which is known for its Seaport museum housing centuries-old ships, and you can follow the Connecticut Wine Trails for wine tasting. Far too often, the interstates are all visitors see as they race through Connecticut en route to more far-flung New England destinations. These are the state's top things to do, and you're bound to decide to slow down and discover some of the must-see attractions in CT.
Two of the largest casinos in North America aren't in Las Vegas or on the Gulf Coast. They're in Connecticut. Foxwoods Resort Casino in Mashantucket, Connecticut, and Mohegan Sun Casino in Uncasville, Connecticut, are enormous gaming and entertainment emporiums. You don't have to be a gambler to enjoy a visit to one or both. Connecticut's casinos are home to some of the state's finest restaurants, and they host many of the most popular concerts and sporting events including WNBA basketball games. Add shopping, spas, comedy shows, and nightclubs, including one beneath a planetarium dome, and you can enjoy a casino visit without setting foot on the gaming floor. Mystic Seaport in Mystic, Connecticut, is America's leading maritime museum, and it's really a fascinating place to spend a day. It's an attraction that alone is worth making the trip to Connecticut. Climb aboard historic ships, watch skilled craftsmen at work, explore a recreated 19th-century coastal village, see exhibits of art and artifacts, cruise along the Mystic River in a coal-fired boat, and learn about how the sea has shaped America's history and economy. Lake Compounce in Bristol, Connecticut, is the nation's oldest amusement park, a distinction that will be lost on your kids, who will only care that this enduring attraction has a cool water park and even cooler roller coasters. If you are visiting Connecticut with your family during the park's early May through October operating season, you owe it to the entire clan to carve out a day to spend enjoying the rides, shows, and nostalgia at this lakeside amusement zone. When October rolls around, the Haunted Graveyard, a scary experience, adds another dimension to your visit. For the ultimate family experience, stay on-site at Bear Creek Campground. The relatively warm and gentle waves at Hammonasset Beach State Park in Madison, Connecticut, make the largest beach in the state a popular place for families to spend sweltering summer days. More than one million visitors head for this Connecticut attraction each year. When summer's crowds dissipate and the seaside camping season ends, Hammonasset is still a scenic place to stroll and to observe the natural beauty of the Connecticut shoreline. Mystic, Connecticut, is also home to another top attraction: Mystic Aquarium. This world-class facility is not only home to sea life ranging from mesmerizing jellyfish to playful penguins, but there is also a 4-D theater, sea lion shows, and the immersive Exploration: Wild. Add to your aquarium experience by reserving your spot in an animal encounter program. Spending time in the tank with a beluga whale may be one of the most memorable things you ever do in Connecticut. Penguin Encounters are fun, too! You may find it a bit mind-boggling that touring a castle is one of the fun things you can do in Connecticut. 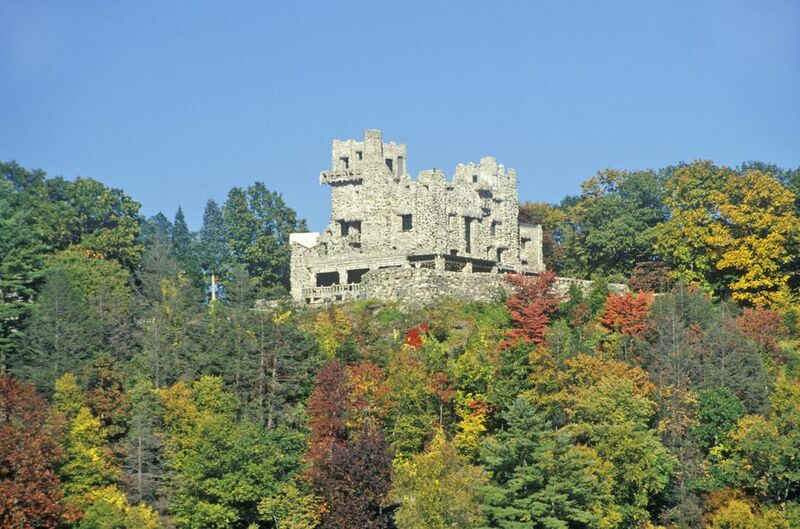 Gillette Castle in East Haddam is an architectural anomaly, and it is quite lucky that the quirky home of actor William Gillette has been preserved as a Connecticut state park. The grounds alone, with their Connecticut River views, will take your breath away. Venture inside the castle for a self-guided tour, and you'll be fascinated by the story behind this intriguing home. Connecticut is home to one of the nation's best museums devoted to Native American history, arts and culture. Built by the tribe that experienced soaring fortunes following the opening of Foxwoods, the Mashantucket Pequot Museum in Mashantucket, Connecticut, is a multimedia, interactive, thoughtfully presented portrayal of the tribe's evolution and its struggle to survive. Don't miss the audio tour of everyday life in a Native American village. Nothing beats eating fresh-cooked seafood al fresco in a waterside setting, and that's what makes Abbott's Lobster in the Rough in Noank, Connecticut, worth a pilgrimage. Well, that and—Abbott's makes one of the best lobster rolls in all of New England: A quarter-pound mound of buttery sweet lobster on a butter-bathed toasted bun. Open seasonally from early May through mid-October, Abbott's is a BYOB restaurant. Bring along a cooler with your favorite alcoholic beverages, and prepare to spend a spell feasting on the food and the views. Off the coast of Connecticut in Long Island Sound, there is an archipelago of tiny, storied islands. One of the Thimble Islands is so small, it holds nothing more than a gazebo. Depart from Stony Creek aboard the Volsunga IV with Captain Bob for a memorable jaunt around these exclusive, private island hideaways. You'll hear tales of pirate treasure, circus legend Tom Thumb and a newlywed couple's revenge on a meddling mother-in-law. If you fall in love with the Thimbles, you can buy a handful of them... if you have a few spare millions of dollars lying around. There are 26 vineyards along the Connecticut Wine Trail, and designing your Connecticut itinerary around visiting a few of the state's preeminent wineries is a lovely way to support agricultural endeavors while encountering some of Connecticut's most picturesque countryside. Most trail members offer tastings and many offer tours. Hopkins Vineyard in New Preston, Connecticut, is one of the most enchanting stops on the trail. This winery's Hayloft Wine Bar on the second floor of a 19th-century barn overlooks scenic Lake Waramaug and is an ideal place to spend an autumn afternoon. Or picnic at Sunset Meadow Vineyards in Goshen and enjoy live music on warm-weather Sunday afternoons.